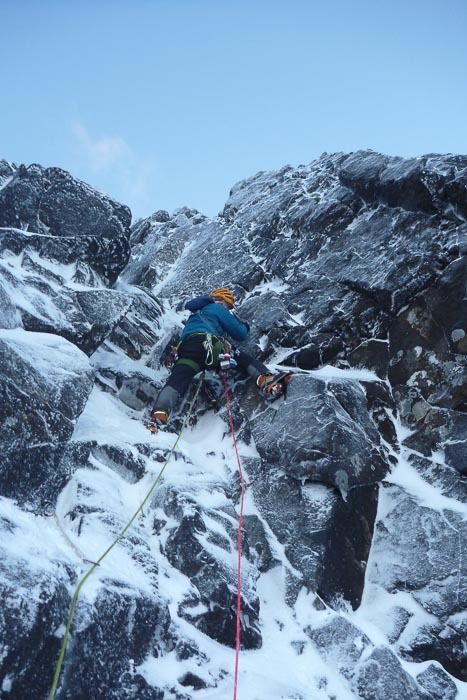 On January 19 Doug Bartholomew and Michael Barnard made the probable first winter ascent of ‘Rudge and Wood’s Route’ on Sgurr nan Gillean. This narrow dyke on the West Face of the Second Pinnacle on Pinnacle Ridge was first climbed in September 1944 by W.Wood and E.Rudge and has likely been ignored ever since. This entry was posted in New Routes and tagged Doug Bartholomew, Michael Barnard, Sgurr nan Gillean, The Cuillin. Bookmark the permalink.